Clouds, cold and drizzle showed up 45 minutes after we arrived on Friday afternoon. Oh well – it was nice while it lasted. The first of our little birds is coming home for the holiday – Meiling arrives tomorrow! Although we talk almost daily via video messaging, it’s been a full year since we’ve seen her because she has been working three jobs back in Oregon to help pay her college expenses and she stayed and worked through last summer. We’re eager to have her here and give her a chance to relax and recharge her batteries. Our first order of business will be to get her to Duane’s Ono CharBurger for lunch on Tuesday – she says she dreams about their burgers all year while she’s away. Brett and I had planned to go down to the south shore for lunch this past Thursday, but our social calendar suddenly filled up so we decided to skip that outing. Friends from Seattle, Alan and Cheryl, are visiting and we had lunch with them on Saturday at Street Burger, in Wailua. Alan and Cheryl own a house here, just up the road from us, and one of these days plan to move over here. And, this coming week friends from Portland will be on the island for a three-day visit, and we’re planning to get together and go out for breakfast at the Kountry Kitchen on Thursday. Amazon Prime has been a lifeline for us here since we arrived, and has provided superb service, but in the past few weeks things seems to have gone wrong with them. An order that was shipped and supposed to have arrived last Monday never showed up, and when I checked with them they had no idea where it was, and the shipping service didn’t either. I was asked to wait until this past Friday to see if it arrived, but it didn’t, and no one knows what happened to the order (Amazon used some third-rate delivery service I’d never heard of before that is apparently rife with problems). On top of that, three other orders that were made toward the end of November didn’t ship until last Friday (December 8) and are scheduled to somehow arrive tomorrow. I’m not really sure how that’s going to happen. Amazon has no answer other than to say “sorry” but they did re-ship the lost item and sent it via USPS instead of the sketchy shipper. Reading: I finished The Leavers on Friday (a very moving book which deals with the issues of abandonment and transracial adoption, among other things), and I’m now reading Pachinko, by Min Jin Lee. It’s one of this year’s National Book Award Finalists, and I’m enjoying it so far. I still have one library book to finish after this, so I’ve put myself on a reading schedule – I have to read at least 17% of the book each day. So far though I’ve been able to do better than that because I don’t want to put the book down. Listening to: The washer and dryer have been going since I got up this morning – I sorted all the laundry before I went to bed last night and we got an early start on that. Otherwise it’s very quiet. Brett has been reading, YaYu still isn’t awake yet and there isn’t a whole lot of noise outside either. Watching: Brett has been watching Peaky Blinders every evening, but I just sort of been checking in once in a while – it hasn’t really grabbed me. I’ve been watching old or preciously seen movies at night for the past few days while I work on Swagbucks – Moonrise Kingdom, Forrest Gump, and Inglorious Basterds are some of the ones I’ve seen. On Friday evening I began (binge) watching the second season of The Crown. I’m loving it of course. Pecan pie bars, one of the most dangerous foods around (for me anyway). 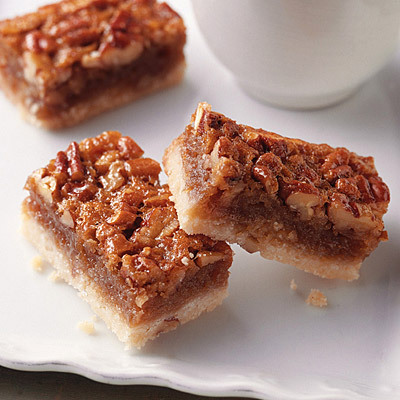 Cooking/baking: I’m making pecan pie bars this afternoon for Meiling – they’re her favorite cookie. It’s going to take a superhuman effort on my part to stay out of them because I love them too, and if I take one bite I don’t think I can stop myself from eating more. We’re having breakfast for dinner tonight: scrambled eggs, sausage, toast for Brett and YaYu, and fruit. 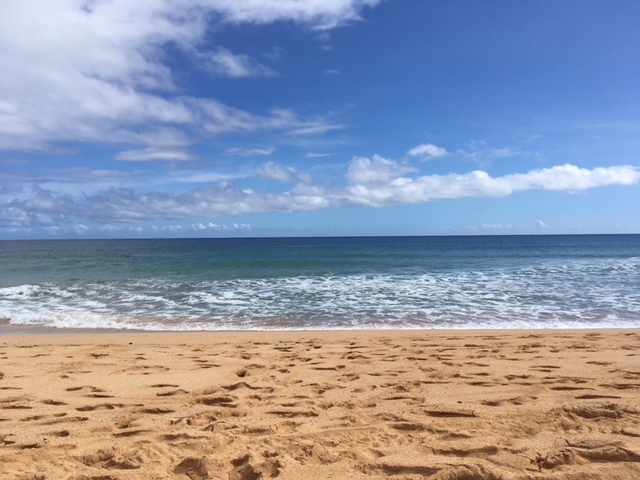 Happy I accomplished this past week: I got Meiling’s and WenYu’s round-trip tickets from Honolulu over to Kaua’i booked this week, and can’t believe I almost forgot to take care of this! I bought the last two Christmas gifts on my list, so I’m all finished now. Brett and I searched and searched and finally booked a vacation rental for our last month here before we begin the Big Adventure. It seems early to do it now, but we were very surprised (and often disappointed) by how many places were already booked for the dates we want. Brett and I walked three miles on the beach path every day except yesterday, I drank at least eight glasses of water a day and studied French for at least 10 minutes every evening. One of the things I’m waiting on from Amazon is a French textbook, but have no idea when that will arrive or even if it will arrive now, but I’m to a point where I need something beyond what I’m getting online. Looking forward to next week: Besides Meiling coming home? What can top that? I’m looking forward to going to the CharBurger with her, cooking for her, and just being able to sit and chat with her in person. We’re doing our Big Shop this week, and she’s going to help with that, and says she wants to help/watch me in the kitchen. She’s also going to help me get the ornaments on the tree. I’m also excited about meeting up with our Portland friends for breakfast this week – besides catching up, they were in Portugal a couple of months ago and we’re eager to hear about their experiences there since it’s one of the places we’re visiting on the Big Adventure. Freshly picked cauliflower at the farmers’ market. Thinking of good things that happened: Even though we didn’t get very much time there, getting down to the beach for even a little while on Friday was wonderful. We had a great catch-up with friends Alan and Cheryl (and a delicious lunch) on Saturday – I love getting together with them and wish they were able to get over here more often (or were living in their house here). One of our favorite farmers had big, crispy heads of cauliflower for sale this past week. 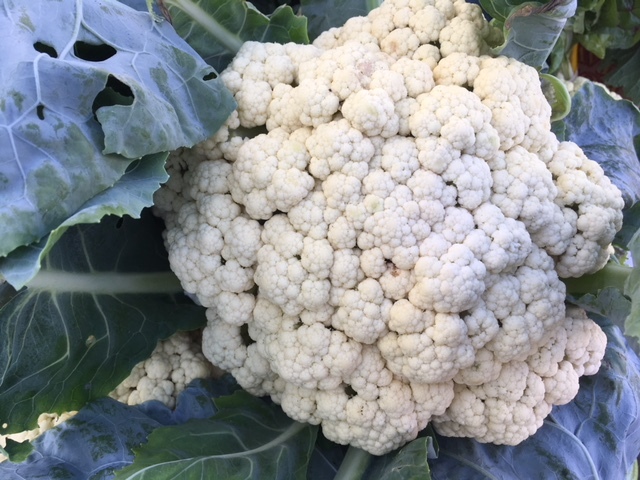 It’s a difficult crop to grow here, but she’s been taking advantage of the cooler weather and her cauliflower was beautiful (and affordable). Finally, I received word that my mom’s estate will finally be settled week after next. Grateful for: I got a huge surprise when I received notice for the upcoming settlement of my Mom’s estate which will be finalized next week. Mom was frugal (sometimes uncomfortably frugal – see below) and saved her whole life. She was able to travel all over the world, and pay for her own care for nearly 14 years, from independent living through assisted living and finally memory care. I was expecting to receive very little, if anything, from her estate because I knew most of her savings had been used up, but Mom surprised us – an unknown life insurance policy surfaced that Mom had paid for in full years ago and that had been sitting around accruing interest. The bequest is not a huge amount, but we’re putting some of what I will receive away for YaYu’s college expenses; each girl will get a small amount (our son doesn’t want anything – he said his grandmother was already very generous to him earlier, which we didn’t know about); and some will go to our niece as a thank you for managing Mom’s financial affairs the last few years of her life. The rest will go into our travel savings. Mom loved to travel, and I think it would make her happy that some of her bequest will be going toward our upcoming Big Adventure. Thank you, Mom! Bonus question: What was the worst Christmas or holiday gift you ever received? My parents did not like Christmas. Both of them were very frugal, and Christmas for them meant having to spend money they could have otherwise saved. We always had a small, sad tree (almost, but not quite Charlie Brown Christmas-sad), and presents were typically minimal and always “useful” things. How my siblings and I kept up hope all those years I’ll never know, but we did and kept wondering if each year was the one where all our Christmas dreams would come true. Anyway, when I was eight years old, my Christmas present was two books from the Time-Life series my parents subscribed to. My mom had put the October and November issues aside when they arrived and then wrapped and put them under the tree for me for my presents that year. I normally loved reading the books but was crushed because I knew they were actually meant for the whole family to use versus just for me, and that afternoon they went on the family bookshelf. It was the most miserable Christmas I can remember, but it has made me be more careful and thoughtful about my own gift choices for others, even when being frugal, so I guess some good came from it after all. That’s a wrap for this week! How was your week? What did you accomplish? What good things happened for you? Next Post Will It Stay or Will It Go? How exciting to have Meiling coming home tomorrow. And the pecan bars look amazing and evil. ha! I’ve bookmarked them for possible Christmas baking in a week or so. We do love pecan pie and they look easier. Yes! The Crown Season 2! I watched E1 so far and I still love it. I’m trying to savor it instead of bingeing the whole thing in a few days. And I’m also watching The Americans S5, which I just discovered arrived at Amazon Prime a while ago and I didn’t notice. It’s a little too close to reality for me right now, but I do enjoy it. We finished Christmas shopping except for two things and we’re still ruminating over them. But all in all, we’re close. I suppose we’ll put up the tree this week…DH is dragging his heels. And he’s decided to install under cabinet lighting this week. Not sure why that suddenly took on such urgency but once he decides it WILL be done. Luckily, it’s just the two of us until a couple days before Christmas. Nice surprise from your mom’s estate. And I’m sure it will be good to have it finalized. OH, and that cauliflower looks amazing. I don’t remember any awful gifts, but the one you shared sounds really tone deaf for a kid’s Christmas. Wow. I couldn’t resist and had a bite of one of the pecan bars – it was delicious, but enough, so apparently their once-powerful hold over me has been broken! They are easier to make than a pie, although I did notice I end up get a lot of dishes dirty, including using every measuring cup in the house. Tone deaf is a perfect description of that Christmas present. There were other Christmases that were cringe-worthy, but those books remain the most disappointing gift ever, especially for a child. It wasn’t like our family was poor or broke either – my parents just disliked spending money and sometimes they took it too far. It’s nice to be ready for Christmas, or almost ready, isn’t it? We just have the food shopping to do, and getting the ornaments up on the tree, but otherwise we’re done. With the girls coming home though it’s certainly not going to be calm hahaha. Have not really begun Christmas shopping. Nothing for my mom. Don’t know what to get for a hoarder who keeps everything. Have been trying to clean up their house and she is very upset with me right now. Don’t know what to get her that will not contribute to the mess. Daddy is easy, a gift card from Amazon for his kindle and his favorite flavors of hot chocolate and he is good. Happy that you will finally see Meiling. The best gift of all, family home for Christmas. I have been thinking about your Mom’s gift. Would she enjoy something edible, like a “fruit of the month” subscription or something like that? I know toward the end of my mom’s life she enjoyed getting treats to eat, something she loved but wouldn’t normally buy for herself, versus receiving things. We’d give her things like jam, or cookies, or fruit, and if it was too much for her she would share with others. Anyway, just a thought. I know it won’t be long before our children won’t always be able to be with us for Christmas (like our son), so I’m thrilled they still want to come home now, and can.